No reservations are required, everyone is welcome to visit anytime during our open hours. At the very least, plan one hour for your visit!! Last Admission is one hour before closing. Group discount of 30 or more people that come in together! $10.00 a person + tax! The Aloha Safari Zoo has so many exciting things to see. ​Listed below are some things you should definitely check out during your visit! Stop by our goat and pig field near the zoo entrance to feed our livestock animals some treats that you can purchase at the front entrance. Remember, we ask that you don't feed the horses or giraffe any food from the feed bag. 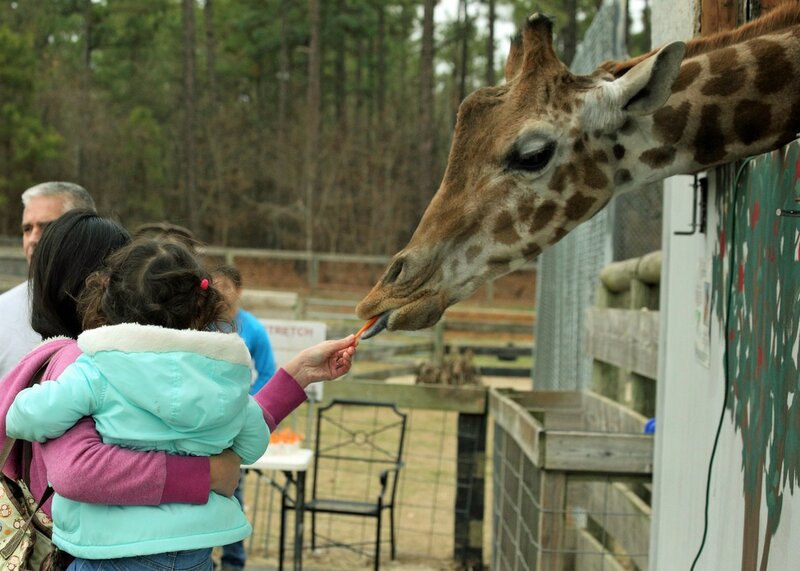 Head to the Giraffe House to feed Stretch the Giraffe some snacks for just $1.00 per cup! Make sure to keep hats, sunglasses, cell phones, cameras, and umbrellas out of his reach! He likes to take souvenirs from visitors as well! Tour our Upper Section of animals by foot by following the paved walkways! You will come face to face with Tigers, a Bear, Wolves, Monkeys, and other exotic animals! Head to the Reptile Room to see some of our exotic reptiles such as bearded dragons, ball pythons, and burmese pythons! Head through our indoor animal area of our main building to see Exotic Birds, Porcupines, Iguanas and more! Be on the look out for Staff Members who have brought out some of our animals for you to interact with! You can learn more information about each animal and see them up close at our Keeper Talks! If you have any questions on any of the animals that you see on your visit or on the facility itself, be sure to find someone in a "Zoo Staff" T-Shirt and they will be happy to answer your questions! Stop by the Gift Shop in our main building to pick up water bottles, T-Shirts, and other Souvenirs at the beginning, in the middle, or at the end of your tour! It's at the main entrance and next to our concession stand that has cold drinks, chips, and hot dogs for you to waylay your hunger! We are proud to announce that we were named one of the Number One Destination to visit in NC by our guests comments on Trip Advisor! We are thrilled and want to thank you all for your support! Be sure to use Trip Advisor to see what others are saying about us or to write your own review!